I'm so sorry! I haven't posted in a week. Mostly sorry to myself because I have been feeling down, and I think I know why, I haven't blogged! :( That's why I have been collecting pictures of different things all week from different events and I'm excited to share them with you! So Sunday, my aunt, my sister and I went shopping. Not mall shopping... COUPONING shopping, like grocery stores and what not :) My favorite kind of shopping! 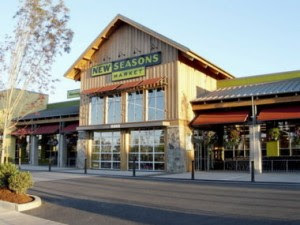 We also went to New Seasons, and me being Miss Organic, I was very thrilled that we were going to New Seasons, it's my FAVORITE store for groceries. The wrappers are so cute! I also bought brie and French bread :) The brie wasn't too badly priced, actually really cheap for brie and that brought smiles to my face! So happy! I got a mushroom-y flavored brie, it was a milder taste than I expected but still so good! I have had a strong brie as well as a mild brie before, and this was pretty mild. SO... on Tuesday, Barlow had a late start. That means dad takes me to Fred Meyer and I get a Starbucks! And I also found Wee Brie! So cute! But every time I was in my 3rd or 4th period class, the people never showed up... but yesterday when I didn't have the cans with me... they showed up in my 3rd period class. I was bummed out. So now they are in my locker and I have to bring them home sometime. ugh. Yesterday was the last day too. REALLY bummed out. Also this week, my honors English class started reading the book Great Expectations. I love it so far! It was a fun, busy week! Also, last night, my friends and I went to go surprise one of my best friends, (Emily), she is in her high school play, GREASE! It was so cute! It was really good! Forgot to bring my program home though, was using it to save seats and it wound up on the floor. UGH and I'm really bummed about that too. I could have gotten extra credit in Theatre class... not like I need it, but it's always nice to have the extra points. I'm really bummed. Wanted it as a keep sake. I still have my ticket though! Haha. Looks like a nice week, what a wonderful cheese counter!! Looks like a really fun store! Now you have me wanting to run out for some Brie & Baguette-yum! It was a nice week! New Seasons is such a cool store. It has a cafe, soup/salad/Greek salad area, and sandwiches at the deli. Plus you can get shampoo in bulk! I thought that was really cool. Ooo yummy! !